Medical Terminology 10 Edition MEDICAL TERMINOLOGY: A PROGRAMMED SYSTEMS APPROACH, 10E is your number one resource for learning medical terminology. Enhanced with innovative built-in tools to make learning easier, interactive exercises, and extensive improvements that reflect the most accurate, up-to-date industry terms today, makes this book an industry leading resource. 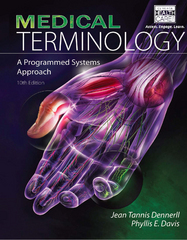 MEDICAL TERMINOLOGY: A PROGRAMMED SYSTEMS APPROACH, 10E uses a unique word-building programmed approach that will teach you to break down key medical terms into their roots, prefixes, and suffixes. This programmed-learning format requires active participation through reading, writing, answering questions, labeling, repetition, and providing immediate feedback. With engaging review activities, back-of-the-book flash cards, and an accompanying CD-ROM with interactive learning activities, this book provides a complete package for building a comprehensive entry-level knowledge of medical language for readers with little or no previous experience. Now in its 10th edition, this book is a proven resource that is easy and fun to use. Teaching medical terminology has never been easier.